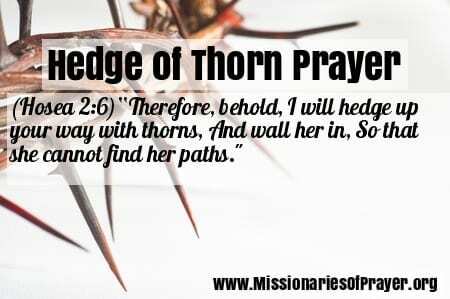 We would like to share with you this hedge of thorns prayer. This is not the same as a hedge of protection prayer. The difference is the hedge of protection keeps what is external from coming in while the hedge of thorns prayer keeps what is in from going out. You should only pray this prayer for people with whom you have a biblical covenant relationship. So this would be for an unfaithful spouse and you can also use this prayer for a prodigal child, drug addicted child, a child who is keeping company with gang related friends. This prayer should not be prayed for your boyfriend, or girlfriend or someone whom you have feelings for that is not your spouse. That would be considered witchcraft because you are not in a covenant relationship with that person. You also don’t really know God’s will for that person so try not to let your emotions and feelings get control of you. Let’s look at the scriptures that talk about the Hedge of Thorns. There are actually 2 scriptures in the King James Version- one refers to laziness Proverbs 15:19 (we’ll cover that in a different post) and the other is Hosea 2:6. Father God, I present to you this day ___________ and ask that you put the hedge of thorns, according to Hosea 2:6, around them to keep them from falling into sin. Cause them to not find the way of unfaithfulness. Cause these ungodly desires to not be fulfilled. May they return to a covenant relationship first and foremost with you, God, and secondly to the covenant relationship that You have ordained from the foundations of the earth. I pray for grace, patience and peace to guard my heart as I wait on You Lord to bring this prayer to fulfillment. I pray that You would send away all these ungodly desires. May _______ lose the desire to go that way, reveal to her/him that this way is destruction and against your will. Give him/her dreams and visions to see that the end is of no good. I pray that You will season my speech with grace so that I will know what to say and when to say it. I pray that you will cleanse my heart and root out any seed of bitterness. Give me grace to forgive. Put a guard over my mouth and show me how I can accommodate the reconciliation and restoration of this covenant relationship. If I have any responsibility in driving ______ away from you God and from this covenant relationship, please reveal it to me. Forgive me God and prepare me for their return. Guide them and me with your Holy Spirit, in Jesus Name, Amen. If you want us to pray for your unfaithful spouse or your child, please write your prayer request below and we will pray for you and for them. Lord, pls open J’s heart so he will sees the true love that I gave him and not on my attitude that is not pleasing to him. Lord Jesus, I begged that you cleanse Lala’s heart and mind so she will realized what she’s doing is wrong. Washed J’s heart so his heart will open and his mind clear to know that true love is by accepting your partners fault and error. I asked you for your blessing and mercy that gushed forth from you heart Lord Jesus. I thank you for this trials and temptations. Call J back home Lord. Amen. Prayers For my wife’s Mindy heart to be on fire for Jesus Christ again and His will for her life. That Abba Father who says He hates divorce bring complete healing and restoration in this resurrection seasons in Jesus mighty name. As in this month of April 2019 and cancellation of court proceeding immediately before May 7th 2019. Remove every hindrance and stand against the work of the enemy of my life and marriage. All external and internal anti-marriage forces. Open doors of opportunity for finiancal advancement for the kingdom of God. All for the glory of king Jesus. Pleading the blood of Jesus over wife Mindy. Needing housing, larger vehicle for 7 children and my heart to remain pure while standing in faith. Pray for my prodigal spouse/husband. He abandoned me and our 5yr old over finances, ego, and material possessions stating he no longer wanted to be bound in marriage. We have been married 11yrs. He has been so nasty and at times I don’t want to pray or ask god why would I pray for person that has rejected God and his family? I can’t make sense of any of this as Ive walked with Christ all my life and have been a devoted spouse, not perfect but righteous to the extent possible. My heart is broken and I am confused as to why God would allow such hurt considering my past hurts I endured as a child – this is yet another blow triggering old wounds. Pray for direction and guidance, our son adores his father and is angry at me and blaming me for his departure. I’m stressed and working and managing my emotions. I’m in counseling weekly but my heart is hurting though I draw closer to god daily I feel as if he doesn’t hear any of my prayers. i ask to pray for My wife Maame Akua Yeboah , she has move out from the marital home to her parent. i ask for my wife salvation and for her return to her covenant husband and family. that all influence be blocked from her path in Jesus name. I pray to Jesus to stop my husband from flirting with other girls and women. Please bless him to realize his mistake n ask God for forgiveness n repent what he has done to hurt me. Bring him down on his knees and completely transform him to become an honest n God fearing human being. Stop him from cheating me over n over again n make him realize the harm he is doing. I ask for prayer for my husband KM, we were married 33 years. He left me for another woman, who he works with and is 16 yrs younger. Our whole family is just devestated over this. I pray Holy Spirit conviction, that his eyes will be open to this sin and distrution , but most of all that he restores his relationship with Christ. Who once meant everything . My heart is so broken, and yearns for the return of my one and only love. I ask prayer for my spouse. He moved out 8 months ago. He was my very best friend and soul mate. Sure, we had arguments, but I did not see this coming. He turns 50 this year and is now seeing a girl 20 years younger than him. He says they are friends, but I am embarrassed and upset. Please pray for his return home. I love and miss him very much. Thank you! I ask for prayer for my broken marriage, for my husband who has had the affair for over 3 years, for our daughter to not be bitter towards him. I also need prayer in removing the other woman, who is an atheist and into the occult, from his life and from coming into the state/city that we live at next week. I believe God is doing a work and I believe that He will finish with a healing. I am claiming this in God’s holy name! 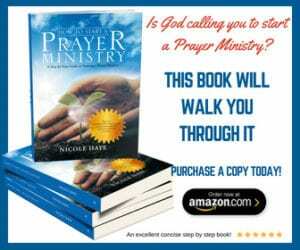 Please pray for my husband – he will receive complete deliverance from all sexual sin, all memories involved, and lust. That he would have eyes and desire for only his wife while he is awake and while he is asleep. That he would see other women through God’s eyes and not see their exterior. That there would be no evil spirit in him that might connect with any evil spirits in them. That any images would not come before his eyes. For restoration of our marriage and family life. Softening of our daughters heart towards her father. I ask to pray for my prodigal husbands salvation and for his return to his covenant wife and family. That all other women be blocked from his path. In Jesus name.